The LED cloakroom side action waterfall cloakroom mono basin mixer tap from Ultra, add a lavish, luxurious feel to your cloakroom with this contemporary basin mixer. Characterised by its stylish easy to operate side action lever handle, LED light and open spout. Constructed from durable brass with a quality chrome plated finish. Comes with 10 Year guarantee. Hi, This does not require electric power or batteries, it is powered by the water coming through the tap to make the LED work. Thanks for your question! Q. Why does this not work on a gravity feed system? Is the pressure not strong enough to made the led work? Hi, No, this is because of the cartridge system. 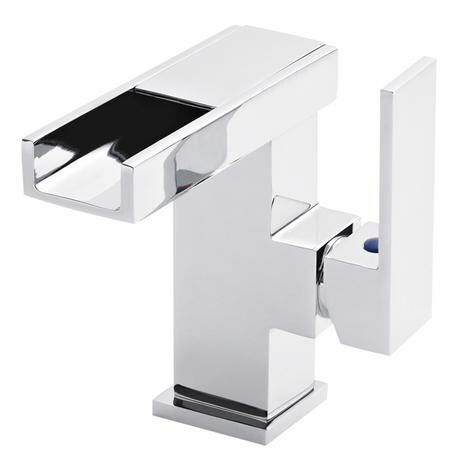 Most single lever taps have a minimum operating pressure of 0.5 bar. I hope this helps, please let me know if you need any further info! Yes. It's standard fitting for most, if not all bathroom or cloakroom basins. Q. Does the Led work with battery? No batteries, it's worked off a pressure system, the more the water comes through the brighter the light, and the colour changes if the water is cold the light will be blue, mild water will be orange and hot water will be red. Nice tap shame about the leak. Great well designed sturdy structure.Fast delivery. Brought tap to replace B&Q tap. the qualitiy of this tap is 100% better than old tap. It looks great and the LED function is a real talking point (granddaughter, loves it. The only thing to warn about is the flexi pipe fitting they connect to washing machine taps so be aware.